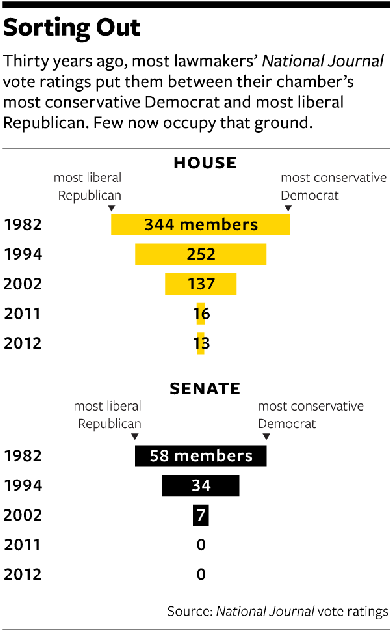 Can This Congress Be Saved? The former lawmaker might be right: Predictions of continued polarization have been a safe bet in Washington for more than a decade. Such a wager would have been dead on for 2012. NJ's annual vote ratings found that historic partisanship once again gripped Congress. For the third year in a row, no Republican member of the Senate had a more liberal voting record than any Democrat — just as no Democratic senator had a more conservative record than any Republican. 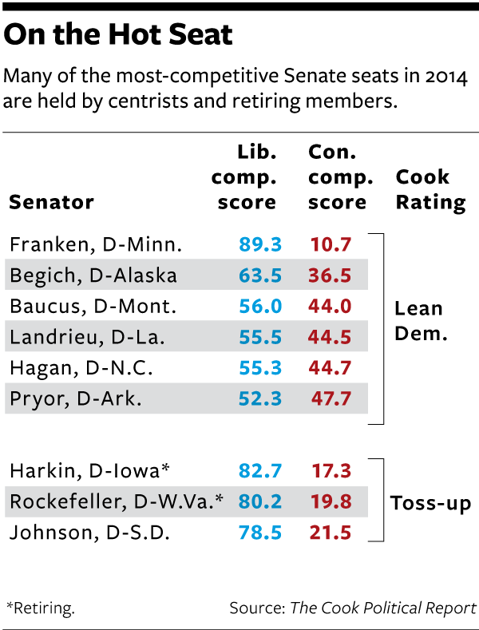 What was once a milestone in the ongoing march of political polarization — the absence of ideological crossovers in National Journal's rankings happened for only the second time ever in 2010 — is now nearly as unremarkable in the Senate as naming a post office. Democrats were in a similar position from 2007 to 2009, when they controlled Congress but wanted to wait out Bush's tenure. The lack of bipartisanship, of course, didn't prevent major legislation from becoming law over the past 10 years. But when Democrats controlled Washington and passed the Affordable Care Act in 2010, or similarly empowered Republicans approved Medicare Part D in 2003, they didn't need the backing of the other party — and by and large didn't get it. But drawing comparisons to that period is difficult because of 9/11; and, besides, most of Bush's term is hardly associated with bipartisan comity. The better parallel — and the experience current optimists point to — is 1996 and 1997, which bridges the end of President Clinton's first term and the beginning of his second. That two-year span saw agreements on a series of important issues, ranging from two big-ticket items (welfare reform and a balanced-budget agreement) to lesser-known achievements (such as raising the minimum wage). The similarity between that period and now extends beyond the split control of government. Only a year earlier, Republicans had ridden the "revolution" of 1994 into control of Congress, when they promised to push their agenda whether Clinton approved or not. But the party ultimately dealt with political setbacks, none more damaging than the government shutdown of 1996. The public blamed Republicans, and afterward Clinton never again trailed GOP presidential nominee Bob Dole (who was Senate majority leader at the time of the shutdown) in a head-to-head matchup, according to preelection polls. But Obama's standing could weigh more heavily on House Speaker John Boehner and Majority Leader Eric Cantor than on their followers; Cantor has recently attempted to rebrand the party with a softer image. While their charges' interests are more parochial, they have the national party's image to worry about. Popular opinion could prod the two leaders to reach agreements with Obama, especially on emotional issues such as gun control and immigration. Or, at the very least, public pressure could work to ease the disagreements that make even basic government action difficult — a factor that might have been at work when House Republicans engineered a three-month delay of the debt ceiling. "They're hearing the message outside the Beltway that "˜we elected you people to make things work,' " said John Breaux, the former longtime Democratic senator from Louisiana. Maintaining that momentum in the House won't be easy, and it could require Obama's personal leadership. Getting Boehner to take such a perilous route could depend in large part on successful cajoling from the president. And on this subject — the relationships among Washington's top leaders — discussion of a deal being cut becomes sharply pessimistic. The belief among the GOP that the president won't act on good faith in the current negotiations is further straining the broken relationship between the two men. Rather than trying to cut a deal with Republicans, Obama might work only toward defeating them in next year's midterms, to try to re­-take the House. At that point, assuming his party retains the Senate, congressional Democrats would be poised to pass legislation as they did during Obama's first two years in office. "In the matrix they're crafting to take back the House, there's no function for bipartisanship," said Mike Ference, a former aide to Cantor. Political enemies have worked together for the common good before. Boehner and the late Sen. Edward Kennedy collaborated on No Child Left Behind. And Gingrich got along famously with Clinton, Breaux said, because the two men respected each other. "Even when he was trying to impeach [Clinton], they were still able to overcome that and get things done," Breaux said. The onus falls particularly hard on Boeh-ner, whose struggles to control his conference are well documented. More than any other player in Washington, he will determine whether anything gets done this year. How he decides to proceed could rest on how frequently he's willing to leave conservative colleagues out in the cold and, consequently, how far he's willing to risk his speakership. The good of the party, and not his seat of power, propelled Boehner's decision to bring the superstorm Sandy relief bill to a vote earlier this year, when it passed with just a minority of support from Republicans. That combination — Democrats and the moderate wing of the House GOP — is the pathway to enacting a sweeping set of bipartisan agreements. A week after the storm vote, a large bipartisan majority passed a three-month extension of the debt ceiling. "It is hard to see this Congress being viewed as a bipartisan one, but we have seen a glimmer of light on the recent bipartisan vote to extend the debt ceiling," said Ron Bonjean, a onetime aide to the Republican leadership. Recent events on the Hill have only furthered the view that both sides are as disinterested in working together as ever. After a momentary blip of cooperation — the deal to avert the fiscal cliff — the institution has backslid into old, familiar ways. The ongoing standoff over the March 1 sequester has closely resembled the legislative gridlock of last year, and the Senate's filibuster of Defense Secretary nominee Chuck Hagel — whose position once rose above political squabbles because of its importance to national security — was yet another milestone for line-in-the-sand partisanship. In today's context, defining success is important — and requires a healthy dose of both skepticism and pragmatism. There's little hope that this Congress can reverse the gradual, decades-long increase in polarization — exacerbated by, among other things, powerful special interests and partisan media — that has gripped Washington. The forces that drove Rep. Boren out of Congress remain potent, and the legislative atmosphere on Capitol Hill is still toxic. Instead of a long-term course correction, the question is whether Republican leaders in the House, President Obama, and Senate Democrats can facilitate a reprieve — if only to show the public that the institution is still functional. Cutting a deal with the broad backing of both parties isn't a question so much of relieving those pressures as of learning to pass laws in spite of them. What eventually passes and what doesn't will come down to the individual pieces of legislation. Observers believe that immigration reform, already being crafted by a bipartisan group of eight senators in the upper chamber, has the greatest chance for passage, because of the high stakes involved for the GOP. But many caution that success will still hinge on the yet-to-be determined details. Murkier still are the chances of passing gun-violence measures — particularly banning assault rifles or high-capacity magazines, and strengthening background checks — not to mention a grand bargain on deficit reduction. CORRECTION: A graphic accompanying this story originally indicated that Sen. Mary Landrieu, D-La., would not seek reelection in 2014.